Economic development is vitally important to our state and the real estate industry. REALTORS® across our state are already engaged in many aspects of recruitment and retention of companies to our state, but how can we be more engaged as a group? The NC REALTORS® Economic Development Committee has been addressing that very question over the past two years, and we are excited to show you what we have learned! We are proud to introduce to you the NEW NC REALTORS® Economic Development & Real Estate Resource Guide. 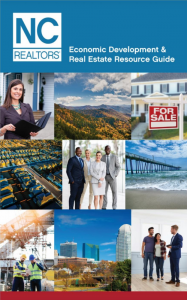 This guide is intended to serve as a reference manual to assist local associations and NC REALTORS® in their efforts to engage with economic development and business recruitment efforts in their local communities. Included within are numerous resources that demonstrate all that North Carolina has to offer to assist you in engaging with economic development efforts in your local communities.